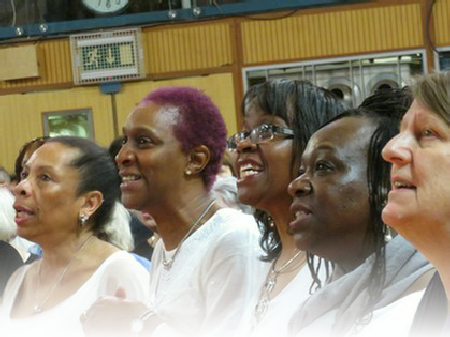 The main part of the festival day encompasses the joyful and uplifting experience of singing as a mass choir with up to 500 voices, learning a selection of songs together in four part harmony. Each part is taught aurally, by one of four experienced and dynamic teachers. The songs are built up in short sections, coming together with great ease - resulting in an instant choir! Singers are given word sheets, but there is no sight reading or written music. The songs taught at the festival come from a wide range of traditions and cultures across the world. Over the years we have sung gospel, folk, songs from Africa, the Americas, Australasia, the Pacific, the Balkans, Europe and some pop arrangements. We have also premiered some original songs. All in a cappella four part harmony and occasionally with movement! Set in the heart of Stratford upon Avon, the venue is a few minutes walk from the town centre, the river Avon and theatres. Facilities include the large and airy Levi Fox hall, a refreshments area, rehearsal spaces, a courtyard and a lovely grassy area where lunch can be eaten (weather permitting). There is parking for around 70 cars at the Festival Venue. Disabled places must be booked in advance. A variety of teas and coffee and biscuits are available on arrival and during each break. The site is well set up for all abilities, and with advance notice we can accommodate most requirements. Initial applications have been made and places allocated, but places do become available. 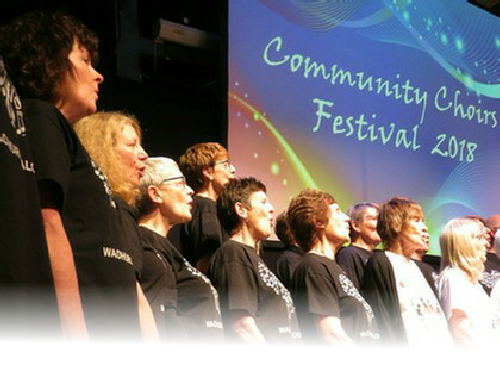 If you are interested in attending as a choir or as an individual, or if you would like to join the mailing list, please contact admin@communitychoirsfestival.co.uk. Every choir has the option to perform one song (or two songs if more than one choir is performing together) in the afternoon concert with an audience made up of the other choirs and a few guests. Choirs could not hope for a more receptive and friendly audience, and being sung to by more than 20 different community choirs is totally stunning! All performances must be a cappella (unaccompanied). Concert-only ‘tickets’ (£5) are available for family and friends and are booked through the choir leader. There are busking opportunities around the site during the lunchtime break. 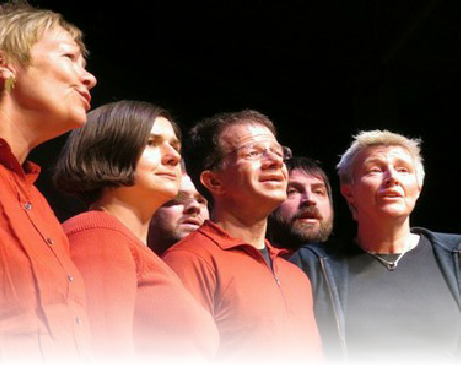 The Festival originally brought together Natural Voice choirs from the Midlands for a one day event. It proved to be so popular that we decided to hold a second identical day. We now welcome a rich variety of choirs and singing groups from across the UK.